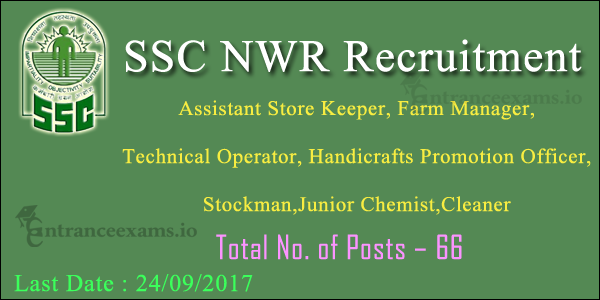 SSC NWR Recruitment 2017 – Apply Online for 66 Technical Operator, Store Keeper Jobs: The Staff Selection Commission issued the SSC North Western Region Notification 2017. This issuance of this notification is to fill 66 Technical Operator, Cleaner Posts. Willing candidates can refer the Staff Selection Commission NWR Notification 2017 to ensure your eligibility. Scroll down the page for the SSCNWR Recruitment 2017 Apply Online steps, Selection Procedure, Pay Scale, etc. Here is the good news to the most awaited candidates for the Central Government Jobs. The Staff Selection Commission released the SSC North Western Region Vacancy Notification 2017. According to this notification, the board is inviting the online applications from the skilled individuals to fill SSC NWR Group C & D Jobs. It is the excellent chance for the job fighters. So, those candidates who wish to work in the Staff Selection Commission have to apply for the SSCNWR Recruitment 2017 before 24th September 2017. Before applying, the applicants need to check the official notification for finding your eligibility. Contenders can find the SSC NWR Vacancy 2017 Notification at www.sscnwr.org. For the sake of the applicants, we provide the overall information of the Staff Selection Commission NWR Jobs in the below sections. So, have a look at this page. For Technical Operator Posts: Aspirants have to complete Matriculation or its equivalent from the recognized University. Plus, applicants should hold the certificate from Industrial Training Institute in Fitter or Motor Mechanic or Diesel Mechanic. For Assistant Store Keeper Jobs: Applicants who Passed 12th class from a recognized Board are eligible. And, they must have the knowledge of Hindi and 3 years experience in store accounts. The candidates who want to apply for the NWR SSC Recruitment 2017 should have an age between 18 years to 30 years. For the post wise age limitation details, refer the official Staff Selection Commission NWR Notification. The candidates who applied for the Group B & C Vacancies in Staff Selection Commission will be hired on the basis of following rounds. The candidates who selected in the final recruitment process will receive the best salary. But the pay scale differs according to the post they are recruited. So, refer the official notification for the complete pay scale information. For General and OBC Candidates – Rs.100/-. For SC/ST aspirants – No Fee. Applicants have to pay the application fee through SBI Net Banking, Credit Cards, Debit Cards, or SBI Challan. First of all, go to the official website of Staff Selection Commission, North Western Region i.e., www.sscnwr.org. Find the NWR SSC Notification 2017 and refer it to make sure your eligibility. If eligible, click on the “Apply Online for SSC North Western Region Recruitment 2017” link. Now, fill up the online application with the required educational, personal details. Cross verify the details once before submission. Make payment if necessary and then save the application form. Finally, post the application form to the Staff Selection Commission NWR Address. This is all about SSC NWR Recruitment 2017. If you have any other information regarding this notification, ask us through the comments. For the Latest Govt Jobs updates, bookmark our site www.entranceexams.io.